You are shown two positions of the same aircraft relative to horizon. A compass indicates the position changes. 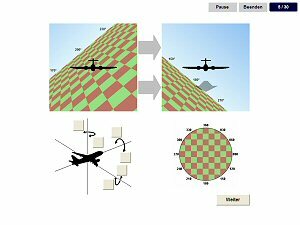 You are to draw the changes in pitch, roll and yaw on an axis model necessary to maneuver the aircraft from starting to end position the most efficient way.